Marimark Mortgage has a new mortgage product specifically designed for investors. This loan allows investors to purchase or refinance properties, only using the property’s income and debt to calculate the debt-to-income ratio. There is no limit on the number of properties the borrower may have financed, since this mortgage product is under the FNMA conventional program. The refinance program allows the borrower to either refinance the rate and term of the existing loan, or take cash out of the property if there is sufficient equity. Maximum cash out allowed is $250,000 if the loan-to-value is over 50%, and $500,000 for loan-to-values less than 50%. Here are the key features of this mortgage product. Non–owner occupied with 1-4 units. Minimum 1,200 square feet of living space and Maximum 2 acres of land. For a refinance, property cannot be listed for sale at time of refinance. If a cash-out refinance is desired, the property cannot have been listed for sale in the previous 6 months. No bankruptcies, foreclosures or short sales in the last 7 years. No loan modifications in the last 3 years. At least 5 years of credit history. No mortgage/rent late payments in last 24 months. No significant derogatory activity on any accounts within the last 36 months – “significant” is considered to be 60 days late. The borrower’s credit must reflect at least 3 open accounts, of which 2 must show activity in the last 24 months and one must be a mortgage with at least 24 months history. For a 1 unit property, the maximum loan-to-value allowed is 75% and is based on the lower of the appraised value or purchase price. Maximum loan-to-value ratios for 2, 3 and 4 unit properties range from 65 – 70%, however, if any of the units are vacant, the maximum loan-to-value is 65%. On a refinance where the property has been owned less than 12 months, the loan-to-value will also be based on the lower of the appraised value or purchase price. The debt-to-income ratio will be calculated by dividing the PITI (principal, interest, taxes and insurance) on the subject property by the gross rental income for the subject property. No other income or liabilities will be considered in the calculation. The gross rental income will be the lesser of the COMPARABLE RENT SCHEDULE, prepared by the appraiser, or the current lease agreements if available. The maximum debt-to-income ratio for single unit properties is 65%. Two, three and four unit properties allowable debt-to-income ratios range from 70-80%. Although only income from the subject property is used in qualifying, the borrower will still be required to provide employment/income information on the application and will also sign a 4506T form allowing the lender to request tax transcripts of returns filed for the last two years. 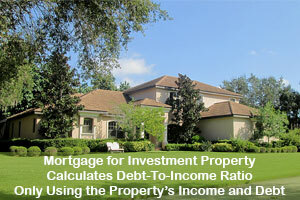 Here is an example of how this mortgage product would work for a 1 unit property. The unit is occupied and has a lease in place for $1,200 monthly. Appraised value is $110,000, and comparable rent schedule shows $1,100 rent. The loan amount will be based on the $100,000 purchase price and the allowable rent used for the debt-to-income ratio calculation will be $1,100. Since the unit is occupied, the maximum loan-to-value of 75% will be allowed resulting in a maximum loan amount of $75,000. Assuming a rate of 7% and monthly taxes and insurance of $200, PITI would be $700. The debt-to-income ratio would be $700/$1,100 or 63.6% and thus within the allowable amount. Reserves of 18 months PITI will be required for the first property financed under this program. Additional properties financed will require 24 months reserves for each. For borrowers under age 59 ½, at least 50% of reserves must be in a non-retirement account. Maximum 6% contribution by seller to closing costs and prepaid expenses. At least one of the borrowers on the loan must have owed a property in the last 3 years. Related party transactions are generally not allowed. The borrower cannot be a trust, LLC, corporation or foreign national. There can be many benefits to an investment property mortgage that calculates the debt-to-income based solely on the property’s debt and income. Not only does this mortgage provide the flexible financing options investors are seeking, it also helps investors leverage cash flows specific to their individual financial situation. If you would like to apply for an investment mortgage, you can apply online or contact us via email or telephone.